It looked and felt like a regular football game, which is just what both teams wanted. The Dimond Lynx, suspended by the Anchorage School District for two games and nearly two weeks of practice for "inappropriate behavior," returned to action Saturday for the first time since Aug. 18. 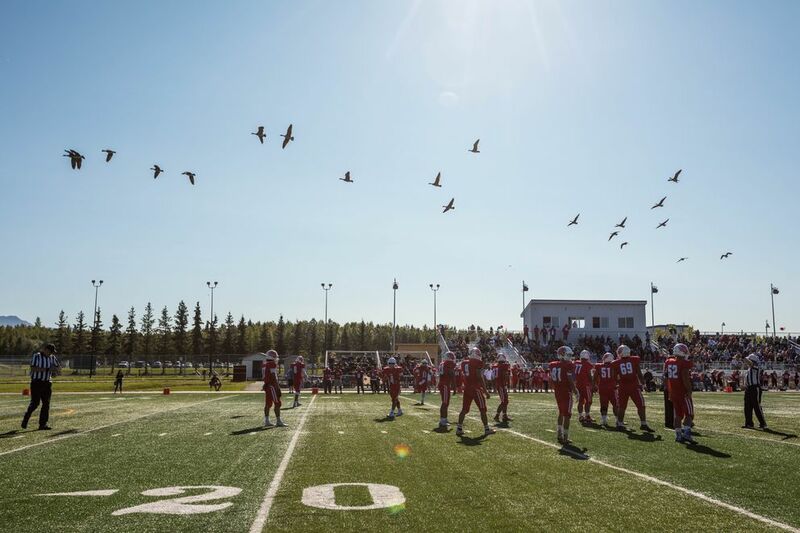 They took a 47-0 beating from the East T-birds on a sunny afternoon at East High, and if anyone there was unhappy to see Dimond playing despite an ongoing police investigation into player misbehavior during a road trip to Fairbanks, they made no overt indications. No signs of protest, no taunts from the bleachers, no unusual back-and-forth between players at the line of scrimmage. "The district wanted to make sure that wouldn't be an issue," East coach Jeff Trotter said, "but we had already addressed it earlier in the week, and the players looked at me like I was wasting my time. There's good sportsmanship on this team." East took command early, rolling to a 21-0 lead after one quarter and a 33-0 lead at the half. 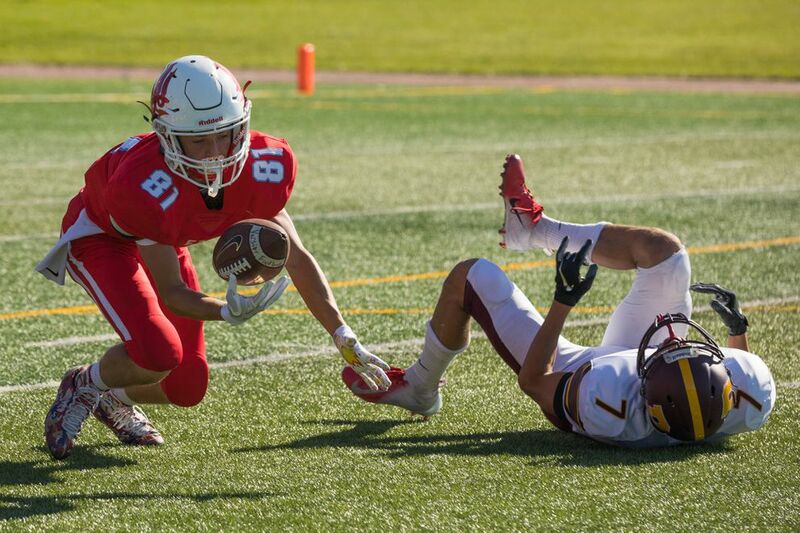 Five players — Kapono Mederios, Colton Herman, Jason Jenn-Lundfelt, Shamir Staten and Alex Hinton — rushed for touchdowns, and Mederios threw a touchdown pass to Albert Timo. The T-birds got another touchdown from their defense when Ja'Sem Antonio returned an interception 75 yards. "Nice blocking," he said with a grin. Antonio, a sophomore, said the T-birds approached the game like any other. "Our coach said it's a regular game, don't put more fuel to the fire," he said. "It shouldn't have gone on as long as it did." He was talking about Dimond's suspension, which included forfeits to Colony and Palmer. 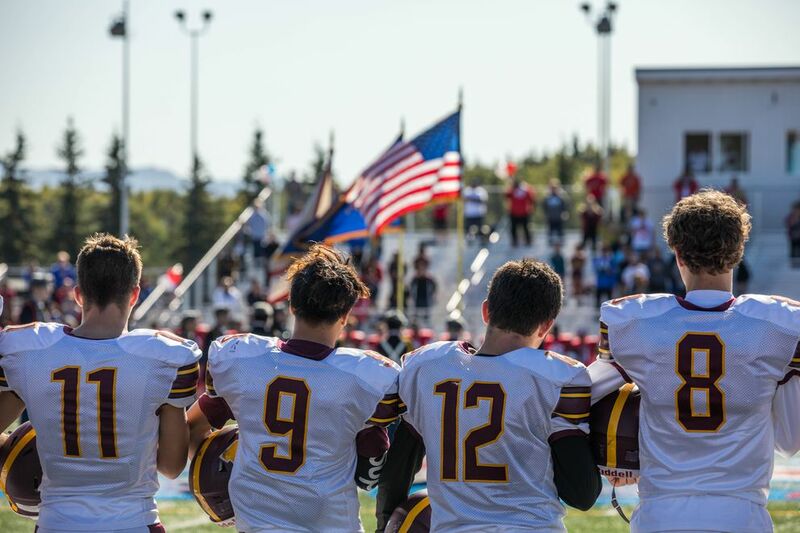 The school district last week "released" three Dimond coaches, including head coach Bernardo Otero, and said it "disciplined" students known to have been involved in the misconduct. 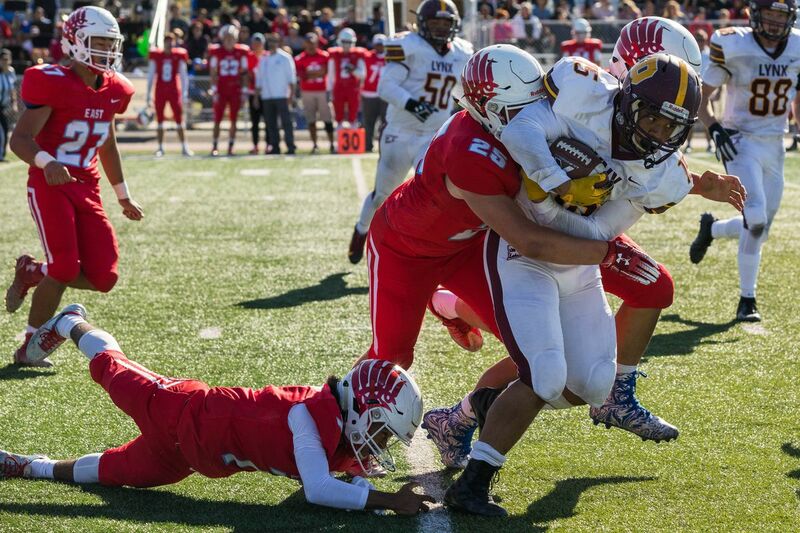 The district ended the team's suspension in time for Saturday's game to be played. "I don't know that the outcome matters as much as having that whistle blow (to start the game) and get some normalcy back," Trotter said. Among those watching the game was Troy Larson, an East High special education teacher. His students had heard about Dimond's suspension, "and they didn't know what hazing meant," he said. They talked about that during class, he said, "and pranks too — what's a harmless prank, and when do you cross the line?" 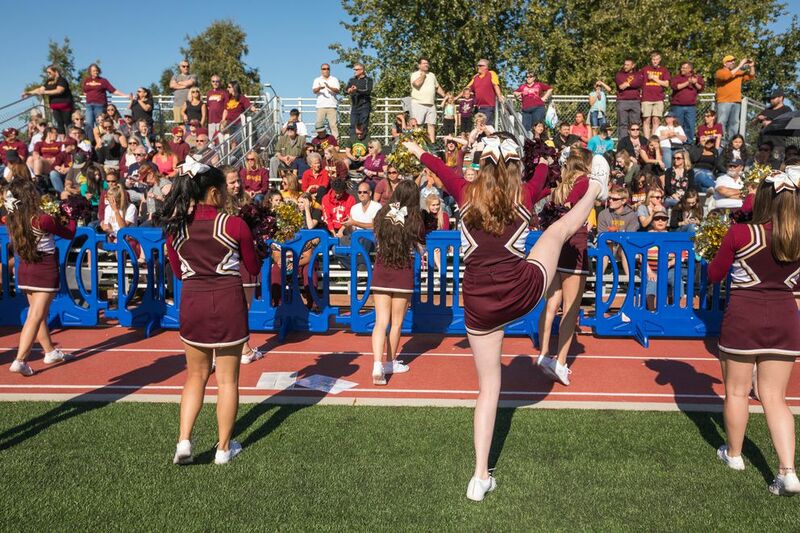 On the other side of the field, Dimond fans wore maroon and gold as they cheered on the Lynx. Megan Whetten, the mother of Dimond quarterback Riley Whetten, was one of them. Besides her maroon shirt and maroon hat, she wore a fat, furry Lynx puppet on her left hand. "It's awesome to see them out here," she said. "They need this to heal. I'm just grateful the school district saw the need for them to get back out here." Whetten said she hasn't hesitated to wear Dimond gear around town, and when she does, no one has responded negatively. "I think there's a lot more love and compassion than what has been portrayed on social media," she said. "One incident is not going to define who we are." Daniel Savinis, a defensive end for the Lynx, was animated throughout the game, waving fans to their feet after R.J. Cavazos caught a pass for a first down that put Dimond on East's 29-yard line. The Lynx got to the 16-yard line on that first-half drive before they fumbled the ball away to East. They were in the red zone again in the fourth quarter when Antonio's interception ended their hopes. Savinis gave his team good marks, especially considering the circumstances. "We just have to keep working on it," he said. A senior who hopes to play college football, Savinis said he thought the suspension might mean the end of high school career. When the school district announced that the Lynx could resume play, "I was ecstatic," he said. "It feels good to be back," said Dimond senior Jackson Justice, who also said he wasn't sure if the team would ever play again. "It doesn't feel good that we lost, but it feels good to be back." After the game, the Lynx lined up in front of the Dimond bleachers and sang the school song. A few moments later, new coach Derek Brewer walked over to the fence around the field where Otero, the old coach, stood. Brewer said he was glad Otero was at the game. The district quickly prohibited contact between players and coaches after the Fairbanks trips, and some players were seeing their old coach for the first time in nearly three weeks. "I thought it was a good thing," Brewer said. "It allowed us to have a face-to-face talk, and it gave the kids a chance to say hello — and goodbye."